As with many visual theorems, my first impulse was to make a dynamic visualization. Off to GeoGebra! But I quickly hit a snag... I didn't know how to construct the tangent circles. I made the basic set up and then starting monkeying around. Eventually I thought about how to just make a circle tangent to one of the interior circles and the line. I made a tracing point with the distance to the interior circle and the dividing line and traced along where it would be equidistant - a requirement for a circle tangent to both. Of course - a parabola. To be tangent to a circle and a line is like the definition of a parabola as all the points equidistant from the directrix and focus. The point D had to be on the parabola, which helped me to find the directrix. The focus had to be the center of the circle. So then the other parabolas weren't too hard to find. The center of one of the twins had to be both on a parabola of tangents to an interior circle and the line, and a parabola for the enclosing circle and the line. And now we can see that Archimedes result was true in general. 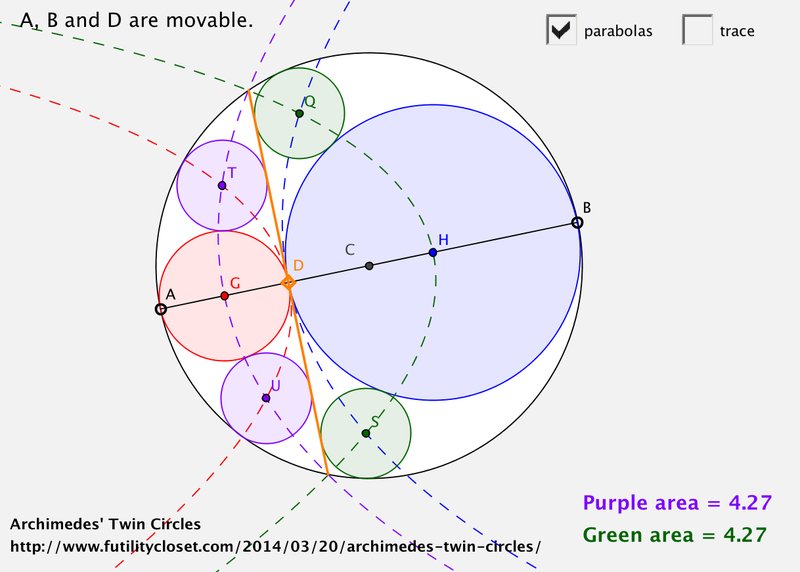 This is a special case of the Apollonian Circle problem (finding a circle tangent to three non-concentric circles &/or lines), and I feel like it was helpful in deepening my understanding of that. To be specific, a special case of the Circle-Circle-Line special case. But it was fun. Now that we can construct them, how would you prove the twin-ness of these circles? The sketch is, as usual, up on GeoGebraTube for you to play with yourself. They are no longer twins. 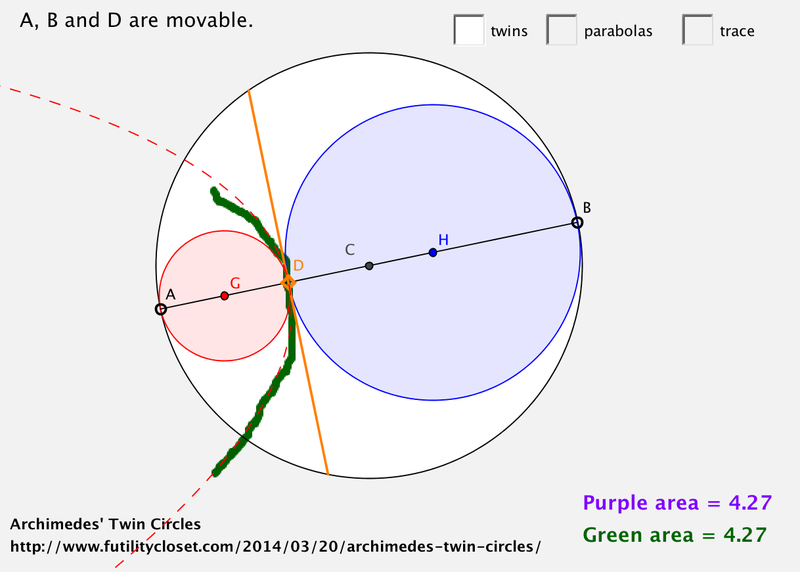 E.g., Circle Triplets. But there are more, Arbelos, and even more: C.W. Dodge, T. Schoch, P.Y. 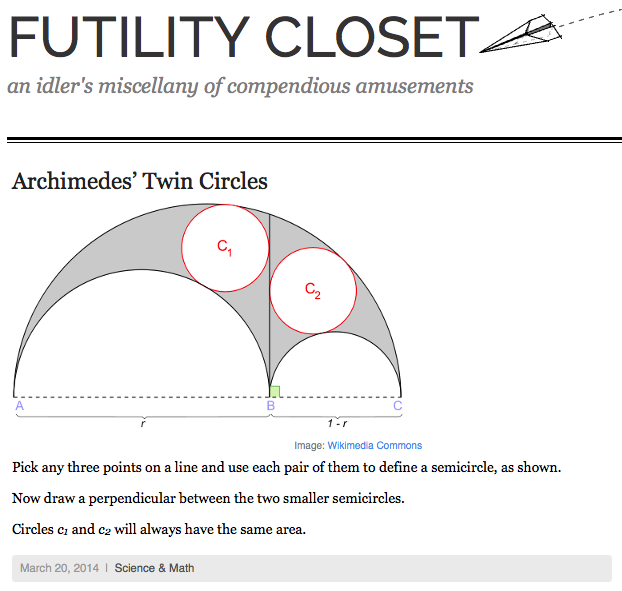 Woo, and P. Yiu, Those ubiquitous Archimedean circles, Mathematics Magazine, Vol. 72 (1999), 202-213. (JSTOR) and Some More Archimedean Circles in the Arbelos, Frank Power, Forum Geometricorum, 2005. (postscript). You're an animal with this stuff. Well! You have shared superb article, the above comment, I don't like it. I think we appreciated this job. if someone want to ask question then share with detail. Any i really like and appreciated your work.